Life insurance might be unpleasant to think about, but it can be devastating to ignore. If there are people who depend on you economically, you owe it to them to prepare for their financial futures in case you die before you’re able to take care of them yourself. Most people already know that they need some life insurance, how much is the appropriate amount? Though there’s no exact number we can give you, considering the proper amount is different for everyone depending on their financial situations, however, here are some general rules you should consider when choosing the policy that’s right for you. Before buying life insurance, first, you need to figure out what your policy is going to need to cover should you pass away untimely. Keep these costs in mind when researching life insurance. How much debt do you owe? The last thing you want is for your dependents to be left with your financial burden after they’ve already lost the income you produce. Therefore, make sure that your policy can satisfy any debt still pending. Calculate how much money it would take to pay off the mortgage on your house and add that amount to your financial obligations. Do you have children whom you would like to send to college? Make sure you still can even if you’re no longer alive to personally see it through by adding roughly 100,000 dollars per child to your policy, covering all educational expenses. Aside from the significant expenses listed above, you cannot forget about the day-to-day cost of living. Food, car insurance, doctor visits, utilities, taxes, etc. Though they may not seem like a mountainous burden and do not need to be paid off all at once, the daily expenses of your loved ones must not go ignored. Nobody knows your financial situation as well as you do, so think carefully about any other expenses your family may be left with in the case of your passing. For example, if you are a stay-at-home parent, then add to your policy the cost of child care services. What about funeral expenses? Does one of your dependents have a serious medical condition that may lead to costly hospital bills? Whatever variables exist in your life, you need to discern the price and make sure your policy can account for it. Though there is no way to find the perfect amount of life insurance you need down to the penny, this guide should get you as close as possible. First, add of your annual salary and multiply it by ten. Then add any mortgage, debt, or educational expenses. This should be enough for whatever your loved ones require to live in comfort without any extreme financial burdens. What Assets do You Already Have? After you’ve calculated how much your dependents need, subtract from that amount any liquid assets such as existing life insurance plans, savings, amount already invested in college funds, etc., so you are not paying more than necessary. Since our lives are changing continually—you could move to another state, get another job, have a new baby, etc.—it may be a good idea to get multiple, smaller ‘term’ life policies rather than a single ‘whole’ policy, that way you could save money while getting the same amount of coverage. For example, instead of buying one plan for all of your dependents that lasts forever, you can buy one 30-year terms policy to protect your spouse until your retirement, and a 20-year term policy for your children until they are ready to graduate from college. Term policies are useful, especially for younger people, recently married, with small children, because they are meant to cover your dependents in case you die before their financial needs are met, meaning you can spend less while still getting the security you need. Then, once you outlive your term policies, you can turn them into whole policies which grow in value with time and are tax-deferred. Whole policies are single, general needs policies usually meant to cover funeral expenses and estate taxes. You may even be able to earn annual dividends on your whole life insurance policy; money that can be reinvested or taken as a tax surplus. Therefore, whole life insurance policies can almost be thought of as an investment. Knowing the differences between term policies and whole policies can be the difference between you paying much more than you should, and you spending precisely what you need to protect your family and invest in the future. Life insurance is not only painful to think about, but it can be somewhat confusing as well. Fortunately, it’s not as difficult as it seems, and hopefully, this article was able to provide you with some insight into this critically important topic. 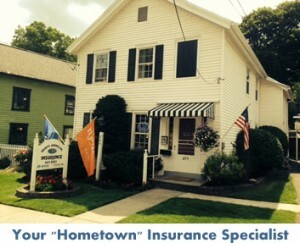 If you would like any additional information, please contact our team at Bieritz Insurance Agency at (607) 547-2951.